Located County Highway S at bridge in Jim Falls Coordinates Lat N 45:02':958" Lon W 91:16':403"
Coordinates Lat N 42:03':524" Lon W 91:16':272"
This wayside is part of the old McCann farm, childhood home of Old Abe, the War eagle. 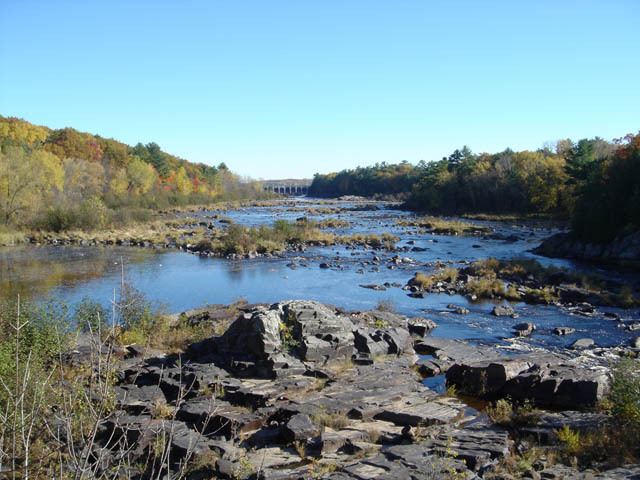 In the Spring of 1861 a band of hungry Chippewa came to the McCann farm and traded a young eagle for corn. The eagle became a family pet. 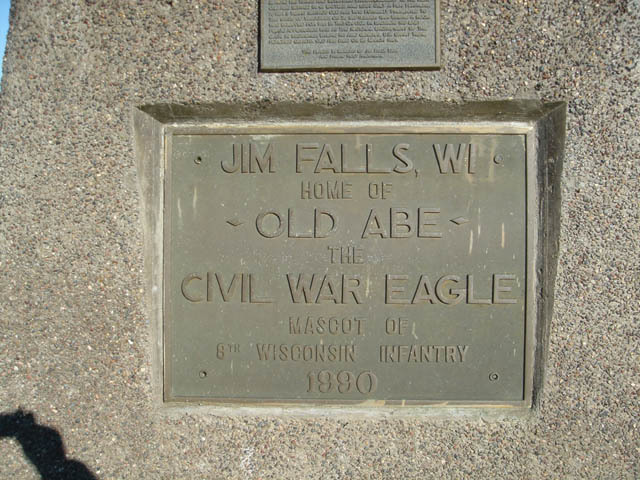 When Company C. Eighth Wisconsin was organized at Eau Claire for Civil War Duty, the crippled Dan McCann offered his eagle's services as mascot, feeling that "someone from the family ought to go." 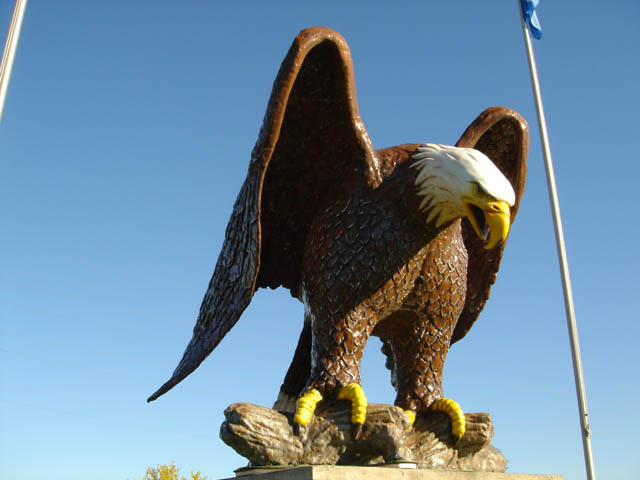 On October 12, 1861, the eagle Regiment started for the front. In action Old Abe spread his wings screamed encouragement to his men. The louder the noise of battle, the fiercer were his screams. 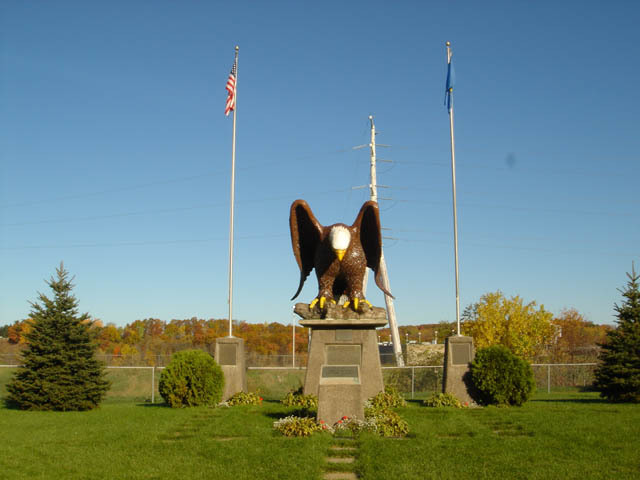 The eagle served with the regiment In 42 skirmishes and battles and lost only a few feathers. 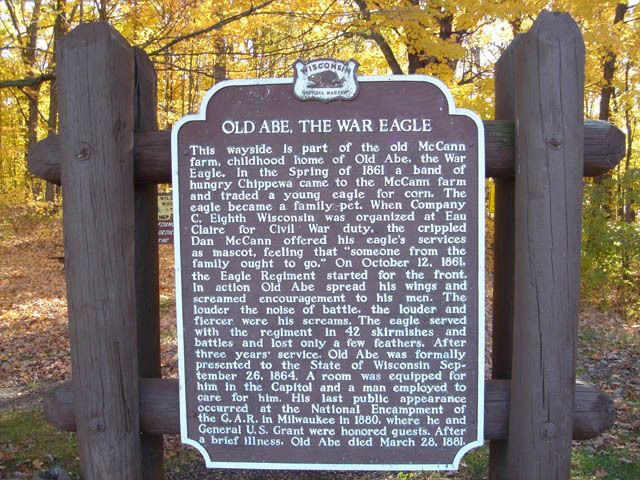 After three years service, Old Abe was formally presented to the State of Wisconsin September 26, 1864. A room was equipped for him in the Capitol and a man employed to care for him. His last public appearance occurred at the National Encampment of the G.A.R. in Milwaukee in 1880, were he and General U.S. Grant were honored guests. After a brief illness, Old Abe died March 28, 1881.